Here’s Betty for the kitchen, ready to help you with your cooking, with dishes, or just to brighten up your outlook. 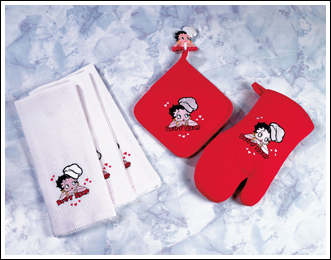 First we have a set of 3 white, waffle-weave cotton, chef Betty dish towels (15” X 27”). Then there are the Bright Boopie Red cotton insulated pot holder and mitt. Finally, we have the Betty refrigerator magnet with hook. It’s perfect for hanging the towel or pot holder.